Georgia has the eighth-highest state rate of incarceration and fourth-highest number of prisoners in the country. Aside from receiving a dental examination at intake to assess oral health needs, there are no efforts to determine the barriers and determinants that contribute to the presenting oral health status of Georgia's state prisoners. Also, there is no prerelease planning to establish a health care home for prisoners being released back into the community to continue oral health care services in an effort to support successful reentry. This study assessed the barriers that impact N=98 female inmates' access to oral health care, prior to incarceration, within Georgia's prison system using a 21-item survey developed by a division of an academic institution and administered by the staff of a state department. Majority of the survey respondents reported that they do not have a regular dental provider (83%), lack insurance coverage (66%), and had their last dental visit more than a year ago because they did not have money for service or treatment (64%). The data collected from this study will be utilized to inform future project efforts to both reduce costs and increase access to oral health care for Georgia's uninsured and underinsured, and especially the incarcerated and reentry populations. The correctional health care system under the Georgia Department of Corrections is the responsibility of the Office of Health Services. This office is responsible for providing physical, mental, and dental health care to inmates in the following categories: Primary Care, Infirmary Care, Medical Diagnostics, Chronic Care, Acute Care, Dental Care, and Mental Health. These services are limited on-site depending on the level classification of the incarceration facility. For example, lower-level facilities, such as transition centers (Level I), may not have in-house medical professionals and will instead arrange for health care from private health care practices. In contrast, higher-level facilities, such as maximum security prisons (Level VI), will have on-site dental offices with a dentist and dental staff. The purpose of this study was to assess the barriers that impact female inmates' access to oral health care prior to incarceration within Georgia's prisons. This study sought to determine the need for improved comprehensive oral care programs within Georgia's prisons and the community at large and identify service and policy gaps in the oral health network in Georgia to assist currently incarcerated women and those re-entering society with oral care needs. There were a total of N=1,501 inmates who participated in the completion of the Oral Health Access Survey. To be eligible for participation in the survey, the inmates had to be processed into the selected study sites (the 2 state correctional facilities) during the designated study period and had to be at least 18 years of age and older. For the purpose of the current study, inclusionary criteria included adult female inmates who completed the survey, reported ZIP codes of residence within the state of Georgia, and who reported that they have not seen an oral health provider within the past year. This resulted in a study sample of N=98. Only female inmates were included in the current study as a pilot project to conduct future research with longer, more in-depth research tools to collect accurate data from both male and female state prisoners. PASW Statistics 18 software was used to conduct all data analyses. Descriptive statistics were performed for each of the targeted variables of interest: demographics (race and location of residence), access to care (having a regular dentist, reason for one's last dental visit, insurance status, and source of insurance coverage), and barriers to care (reason why last dental visit was more than a year ago and ease of finding a dentist). Of the N=98 survey respondents, 51.0% (n=50) were Caucasian/White, 41.8% (n=41) were African American/Black, 6.2% (n=6) were Hispanic or of another racial/ethnic group, and 1% (n=1) chose not to answer. 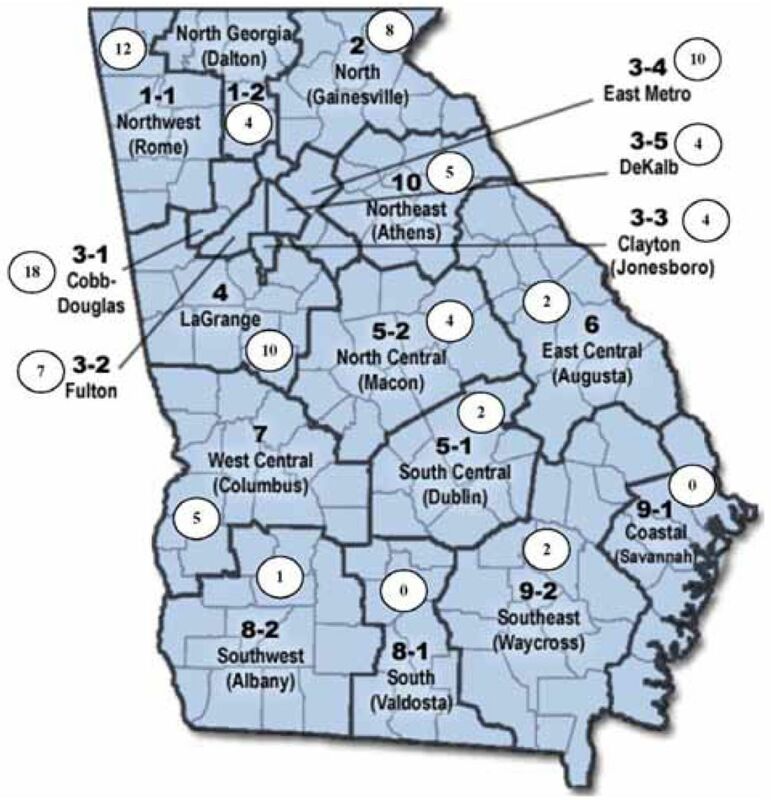 With respect to location of residence, the majority of the respondents (59.2%; n=58) resided in the following state health districts: Cobb-Douglas (District 3-1), Northwest (District 1-1), East Metro (District 3-4), LaGrange (District 4), and North-Gainesville (District 2). Figure 1 displays a map of the number of survey respondents per health district. The majority of the survey respondents (82.7%; n=81) reported that they did not have a regular dental provider. Fifty-seven percent (n=56) of the survey respondents reported that the reason for their last dental visit was for pain. Only 30.6% (n=30) reported that the reason for their last dental visit was to get their teeth cleaned. These results may be due to a lack of insurance coverage, as 66.3% (n=65) of survey respondents who provided their insurance status reported that they do not have health insurance that would pay for dental/oral health services. Of the female inmates who reported that they did have insurance coverage (n=28; 28.6%), approximately 54.0% reported Medicaid as their source of coverage, while 46.0% reported that they had private insurance through their employer (Table I). As previously noted, the study sample was limited to eligible adult female inmates who reported that their last dental visits were more than a year ago (N=98). The majority of these inmates reported that this was due to not having money for treatment (n=63; 64.3%). Only 13.3% (n=13) of these inmates reported that they were afraid or disliked going to the dentist, and 11.2% (n=11) reported that they did not feel there was a need. However, in spite of these barriers, approximately 78.6% of the survey respondents reported that they think it is easy or somewhat easy for them and their families to find a local dentist. With the majority of the women from the current study being uninsured or underinsured, there is an urgent need to develop new policies that will address the fiscal barriers impacting adults and their ability to establish and maintain an oral health home. Although these women did not have a regular dental visit within the previous year, the majority still reported that they think it is easy or somewhat easy to find a local dentist for them and their families. This poses the idea that oral health promotion and prevention efforts must move beyond solely focusing on accessibility, and expand to include multifaceted solutions that can address cost issues and directly connect underserved, high-risk populations with regular dental providers in their area. Having a primary oral health home can help consumers foster effective relationships with providers they trust to provide quality care, increase visits to receive dental services, and maintain optimal oral health. This is essential, especially for vulnerable, incarcerated populations, as previous research has demonstrated the limited ability for correctional institutions to provide quality dental care. There are 12 correctional facilities designated as a DHPSA in the state, meaning there is less than one provider for every 2,500 inmates. Therefore, incarcerated persons are less likely to be able to follow oral health recommendations, which include regular visits to the dentist. Harner and Riley found two dentists having a patient load of 1,600 in one example at a female prison facility.15 Women in the focus groups conducted by Harner and Riley reported being on waiting lists (lasting 21 months in one instance), waiting in pain, poor quality of care (ie tooth extractions that aren't needed), and unprofessionalism by the dentists once they were seen. The women were told to wait for dental treatment until they were released, were cut off abruptly when speaking to dentists, and forced to choose only one issue to be addressed in spite of presenting with multiple dental conditions.15 In addition to assessing the oral health status of inmates at their admission into state correctional facilities, formal policies and procedures need to be established to ensure that inmates receive quality oral health care by implementing regularly scheduled dental services at little to no costs. State reentry-planning committees should also coordinate continued services for inmates upon their release as they return to their community. To support the establishment of oral health homes, the data collected from this study will be used by other investigators to create a new study that aims to create a new workforce model in efforts to both reduce costs and increase access to oral health care. This new study will support emerging workforce models where midlevel providers are certified and work under licensed dentists to deliver oral health care services to low-income and uninsured populations, especially in areas declared as a DHPSA. This impact of this project will serve as a solution to address oral health care access in Georgia's prisons as well as in communities statewide and beyond. Collectively, these studies will help foster the development of population-specific access to care strategies and multidisciplinary partnerships that will improve oral health promotion and prevention efforts among medically underserved populations. Women, specifically those who reside within correctional settings, represent only a fragment of the total unserved population. Despite the overwhelming plurality of respondents understanding the need for care, cost and dental insurance status still hindered care attainment. Dentists, dental hygienists, organized dentistry, and policymakers must be engaged to support the development of policies and practices needed to reduce oral health disparities and advance oral health equity. Moreover, comprehensive solutions should be created that address the systemic challenges associated with establishing or maintaining an oral health home, providing quality oral health services, and reducing the costly burden of episodic care. Henrie M. Treadwell is a Professor, Department of Community Health and Preventive Medicine, Morehouse School of Medicine. Starla Hairston Blanks is the Director of the Community Voices: Healthcare for the Underserved Division of the Morehouse School of Medicine. Carlos C. Mahaffey, PharmD, MPH is a NIDA T-32 Post-Doctoral Research Trainee at the University of Kentucky who served as the Community Voices Director of Reentry during this project. Whitney C. Graves was a Research Assistant, Community Voices: Healthcare for the Underserved, Morehouse School of Medicine at the time of the study and currently serves as a Research Associate, Division of Epidemiology, Department of Family Medicine and Population Health, School of Medicine, Virginia Commonwealth University. This study supports the NDHRA priority area, Health Promotion/Disease Prevention: Identify, describe and explain mechanisms that promote access to oral health care.
. Access to oral health care in the Georgia prison system. J Dent Hyg. 2013; 87(5):271-274.
. Oral health-related quality of life is linked with subjective well-being and depression in early old age. Clin Oral Invest. 2011; 15(5):691-697.
. The global burden of oral diseases and risks to oral health. Bull World Health Organ. 2005; 83(9):661-669.
. The role of health-related behaviors in the socioeconomic disparities in oral health. Soc Sci Med. 2009; 68(2), 298-303.
. Roles of oral bacteria in cardiovascular diseases—from molecular mechanisms to clinical cases: implication of periodontal diseases in development of systemic diseases. J Pharmacol Sci. 2010; 113(2):103-109.
. The patient protection and affordable care act: effects on dental care. N Y State Dent J. 2011; 77(5):34-38.
. Georgia Department of Corrections Oral Health Access Survey, June 2012.
. Factors contributing to poor physical health in incarcerated women. J Health Care Poor Underserved. 2013; 24(2):788-801.